"We had a great time at the conference, everyone there was so kind and it was so heartwarming to see the sense of community. I have to say that your staff is also the best conference staff I've ever worked with, and the most organized exhibit and presenter communication I've ever seen, and we go to a lot of conferences." "BOOST Collaborative has a fantastic team of people to work with. They really know what they are doing and will always do their best to serve attendees and exhibitors in an outstanding fashion. BOOST Conference 2018 was amazing. It had a super upbeat atmosphere with eager to learn attendees. I must say, Palm Springs is a pretty cool destination for the event! If you have the chance, BOOST is definitely a conference to put on your calendars." "My experience at BOOST exceeded all my expectations, not only were we surrounded by individuals and teams from all over the nation but we were also given vital information for After School enrichment. This was a great experience for my organization and gave me a world of knowledge." "The BOOST exhibit hall brings together a great assortment of product and service vendors with a receptive, engaged and dynamic group of potential customers. The conference planners do an exceptional job of recognizing the goals of exhibitors and they create an atmosphere and a schedule which maximizes the opportunities to create meaningful connections. "BOOST is by far the most inspiring conference I have attended in some time. Attendees are awesome and are here to learn and play! If you're looking to connect with out of school time staff and leadership, there is no better conference to attend and exhibit at. We will be back! Thanks to the BOOST Team! The BOOST staff is awesome. From the moment you arrive, staff are everywhere making sure you have what you need. They are a joyful and fine- tuned machine!" "2018 was our first year participating in the BOOST Conference. We featured one our top selling education products and were very pleased with the volume of decision makers we were able to get in front of. The conference was well organized and served as a great networking venue. We look forward to returning in 2019." "We had a wonderful time at the BOOST Conference this year! It was great to network with like-minded organizations in the after-school space. The exhibit hall provided us with an excellent opportunity to meet with decision makers throughout the week, and there was a great energy among exhibitors and participants. We look forward to attending BOOST next year!" -Bruno Marchesi, Director of Strategic Expansion, U.S. Soccer Foundation, Washington, D.C.
"This is was our first experience at the BOOST Conference and as an organization, we are already making plans to attend next year's event. Though it's considered a conference, it exceeded our expectations and raised the bar for how conferences should be organized. The booths were amazing and informative, the activities throughout the day and evening really helped solidify future business/professional collaborations, and the overall experience was well worth it. It was great to meet industry leaders who are in service for our young students. If you're thinking about attending next year...let me make it easy for you. I WILL SEE YOU THERE!!" "It had been several years since we had last attended BOOST as an exhibitor and I forgot how good the conference was. The overall quality of connections far exceeded my expectations. We already registered for next year!" "BOOST brings together a dynamic group of afterschool professionals and provides a great opportunity for exhibitors to network both with existing customers and new prospects. 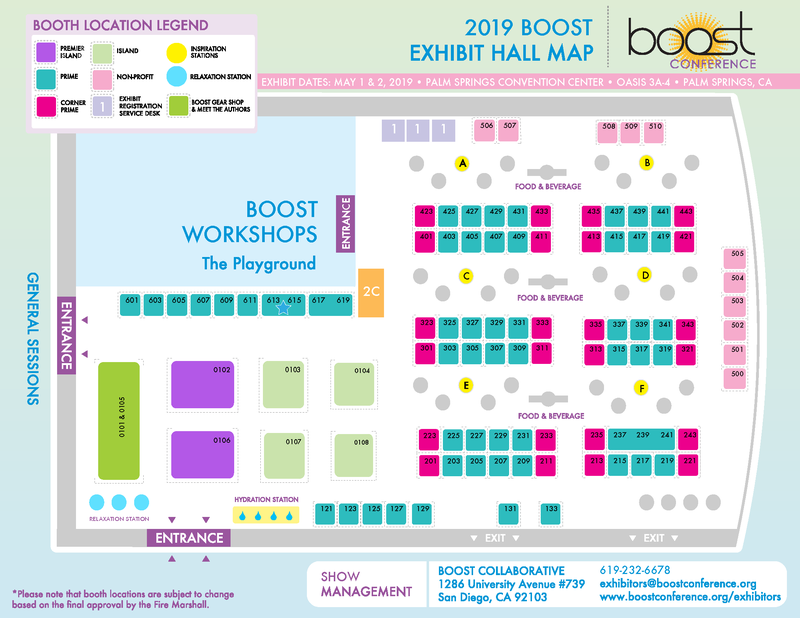 The BOOST staff works hard to meet the needs of exhibitors and understands the goals of bringing businesses and organizations together as potential customers and clients." "The U.S. Soccer Foundation attended the 2017 BOOST Conference for our first time as exhibitors and had a wonderful experience! At BOOST, we learned from and shared our programs’ best practices with fellow attendees. The emphasis placed on collaborative and professional development opportunities created connections that will last far beyond BOOST. When it comes to learning, and sharing best-out-of-school-time practices, this is not a conference to miss!" "BOOST was an incredible opportunity to get in front of key decision makers, all interested in bringing the latest innovations to students. I had a personal conversations with over 100 leaders ranging from site coordinators to district leads. What made the experience even more unique was that I got to exhibit right in front of the games station! It wasn't hard to lure people over when you have ping pong and foosball only steps away! :) Thanks Boost for the opportunity!" "BOOST is always a top-notch conference experience, and this year did not disappoint. The staff and volunteers, from initial contact prior to the conference through post-conference follow-up, are professional, responsive and customer focused. The conference itself continues to evolve and improve in order to maximize benefits to all stakeholders, including attendees, presenters and exhibitors, to name a few. They place incredible attention on the learning/professional development benefits and takeaways, collaborative opportunities, and ensuring all participants have an enjoyable and memorable experience. This is not a conference to miss, and should be on your short list to attend each year." "Always a wonderful conference. Well organized, friendly and helpful. Best conference all around out of all that we attend each year." "We love BOOST! It's always great to see this many people come together with one common goal- after school! BOOST met the needs of exhibitors and supported them throughout the entire conference. They did a fantastic job driving foot traffic and creating a fun environment for everyone!" "This was our second year exhibiting at BOOST. And both years we were able to conduct a workshop on coaching skills. I forgot how friendly and warm everyone is who attends this conference. This makes working with After School folks a delight. Your conference is done with first class style. Thanks for a great professional experience – again!!!" "As an exhibitor, we found BOOST to be one of the most organized conferences we have ever attended. From beginning to end, the team of professional staff is extremely helpful and supportive. We especially enjoyed all of the activities that encouraged interaction with the vendors. By attending BOOST we gained a better understanding of the professional world of after school care, and how we can help programs. Looking forward to next year!" "2015 was our first year at BOOST and it was a huge success! The show was well attended and very organized which was really nice to see. They fed the exhibitors and had unopposed times where all attendees were in the exhibit hall. We did very well, made great contacts, and have seen activity in afterschool programs since we were at the show. We will be back next year, no doubt." "I have been an exhibitor with BOOST with two separate companies over the past five years. The most outstanding and notable compliment I pay to the BOOST Leadership Team is the constant emphasis on continuous improvement each year. It is clear that BOOST values the feedback of their exhibitors and attendees, and the exhibit hall becomes more interactive and robust. BOOST Leadership understands the needs of exhibitors and knows how to push marketing efforts in order to best serve education companies. We sold product in the booth at the conference in both 2014 and 2015! We will be back in 2016!" "BOOST was a great conference to exhibit our cool tools for the youth development field. The set up allowed for multiple interactions with direct service staff and program leads who were excited to engage with us and have conversations to support their work on the ground level, either leading youth or their program teams. Wonderful energy - helpful BOOST staff and lots of demonstrating of walking the youth development talk! Shifting Norms will definitely be back to support BOOST and the Youth Development Field to Grow Thrive and Challenge the Status Quo!" "2015 was my first time as an exhibitor at BOOST, and I was so impressed with this show. It was really well organized, we got lots of walk-by traffic that resulted in many leads that turned in to sales. For a company like ours that is just getting started in the after-school market, this show as a terrific first step." "This was our first year at the conference and our experience was extraordinary. We attend trade shows all over the country as a Presenter and Vendor and we were commenting on this being the best run and most professional of all the 100s we have been a part of. In many cases the Exhibitors are an afterthought in most shows. Not yours!!!! Your show made the Exhibitors feel welcomed, appreciated, and most importantly took every effort to fill the Hall with time allotments that made us front and center. I wish you would write a book on how to give a GREAT CONFERENCE!!! We have already reserved the time slot on our calendar for next year's conference. Wishing you and your staff only the best. See you next year..."
"Well done BOOST! This is our second BOOST Conference and we're amazed at the energy and enthusiasm of your staff and attendees. Two years ago we wondered how some of our products and resources would work for the professionals in your field, and now we have an answer. One of the best run, and fun, conferences I have ever attended - we'll be back!" "It was our first time at BOOST Conference this year, and we will definitely be back. As an exhibitor, there were so many opportunities beyond having our booth that benefited our non-profit organization. We were so grateful for the chance to make meaningful connections with like-minded individuals working to make a difference in lives of youth from all over. We took advantage of attending a few trainings that has helped us learn more about the out-of-school time field and allowed us to further develop our programs. This is more than a conference, but an experience we were glad to be a part of. The energy of attendees was awesome and the BOOST staff made our experience seamless. Will definitely be back!" "Please accept COA’s congratulations on such a wonderful conference this year. We were pleased and proud to be a part of such a well-organized event. From the planning phase throughout the conference to the follow-up after the conference ended, your staff was extremely pleasant, accommodating and professional. Being an exhibitor during the conference, your efforts to ensure a high level of traffic throughout each day made our participation there well worthwhile. We look forward to continuing to develop and expand our partnership with BOOST." "The BOOST Conference has become a must do conference for Learning Wrap-ups, Inc. Each year they bring together a large number of quality decision makers, not only from California, but from around the country. The attendees are looking for materials to help their programs, so we have the opportunity to present ideas to interested potential customers. That is all we can ask for from a conference. Keep up the good work and we’ll keep seeing you in Palm Springs." "I would like to send a great big Thank You to Team BOOST and everyone involved in making this year's BOOST Conference a success. Individuals associated with the event were very friendly and always willing to answer questions as they came up. This was an outstanding event." "BOOST is the most dynamic educational conference we do. There is an excitement for innovation in out-of-school time programming - equal parts optimism and passion - that permeates the event, and the conversations we have with attendees. Not to mention the organizers take great care of the exhibitors!" "The BOOST Conference is one of my favorite conferences to exhibit at. The attendees are engaged and represent leaders in the out-of-school time field. The conference staff have created a number of opportunities to network and the contacts we make are always beneficial to our organization. Returning each year, I look forward to the opportunity to re-connect with all the people I've met over the years." "2012 was our first time exhibiting at BOOST, and we will definitely be back in 2013. It was an extremely well-organized and well-run national conference. Response to our booth was beyond our expectations as a first-time exhibitor."